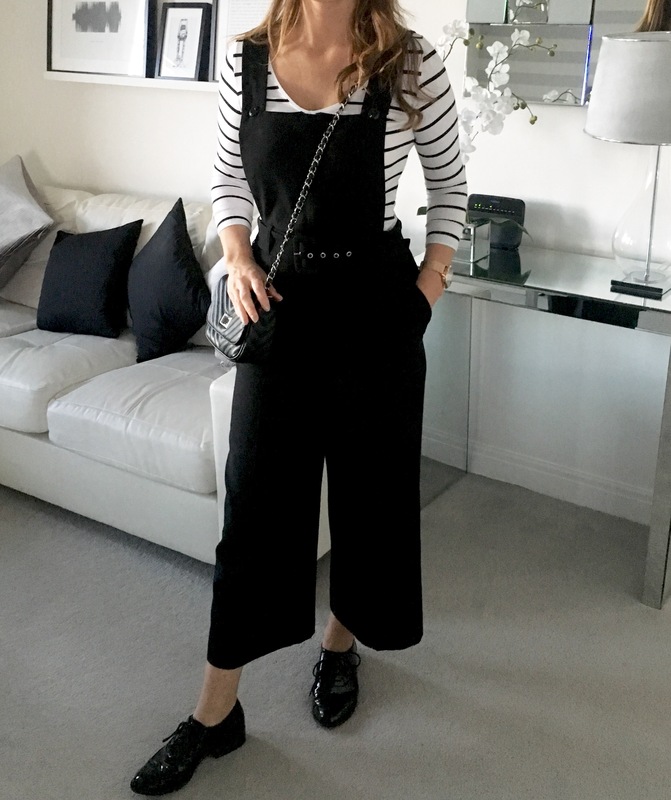 This weeks blog is about a fashion piece I’ve been searching for in the shops for a long time. 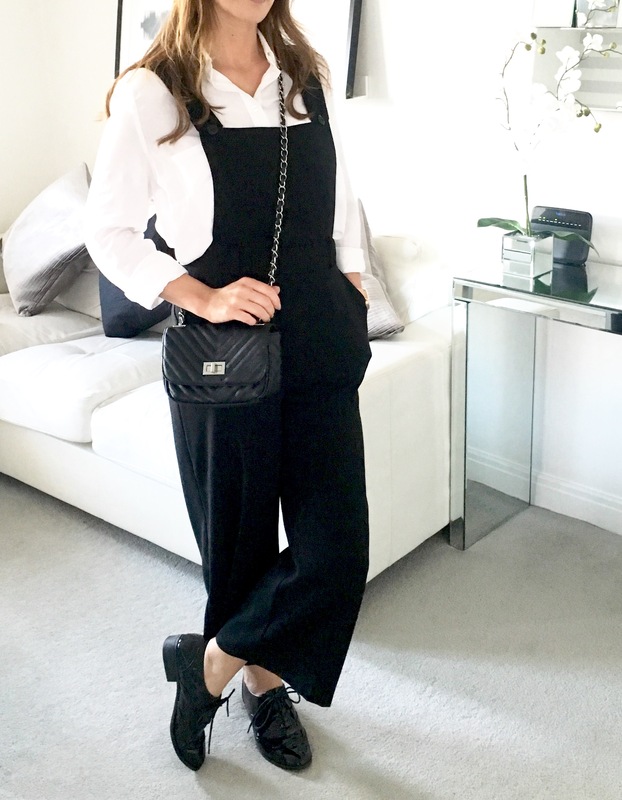 Jumpsuits in many shapes and styles have been quite popular this year and after seeing many instagram pictures and fashion bloggers wearing them I decided that a basic well-cut one would be a good addition to my wardrobe. I wanted to go for a quite tailored jumpsuit and the first one I ordered online had a full length trouser leg. When my parcel arrived I was so excited to rip open the plastic and try it on but to my disappointment and as I often find with online shopping the sizing can be a bit hit and miss. The overall style of it was great and I’d ordered two different sizes just incase, but they were just too small and as you ladies out there know it’s the worst feeling in the world to try on your usual size and find its tight, you’re left with a feeling of dismay wondering have you consumed too much from the bakery this week or you talk yourself into believing it wasnt of great quality and the manufacturers have scrimped on cloth? Anyhow I was back to the internet looking for another one, what I do find with jumpsuits, bodysuits even swimsuits is as a tall girl they can some what cut me in half! 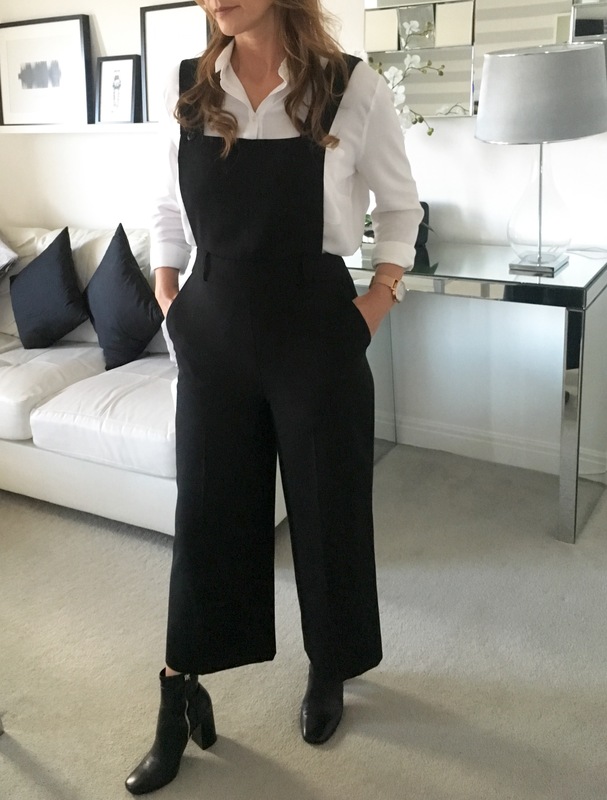 The jumpsuit I’ve featured today I found on the Dorothy Perkins website and it was available in the tall section but as it was a cropped leg version I thought I’d try the regular size first. I wasnt actually looking for a culotte style leg but after trying it on I was surprised just how great it looked with heels or with boots. The body length was ok too and comfortable enough to tuck in different top options without feeling bulky or lumpy around the middle. For a smart daytime outfit I’ve put a crisp white shirt underneath, it looks great with my black boots from Stradivarius. Flat lace up brogues or loafers also look good and show off the ankles as do heels if you’re going from daytime to evening. This basic stripe t-shirt is ideal for a casual look, the long sleeves keep arms warm at this time of year and again flats or boots look great. You can instantly dress up the jumpsuit by adding a touch of lace and heels, this cream lace top is perfect with its high neck and long sleeves and it isn’t covered up by the top part of the suit. I’ve also worn the belt that comes with it just to nip in the waist a little for an evening look. 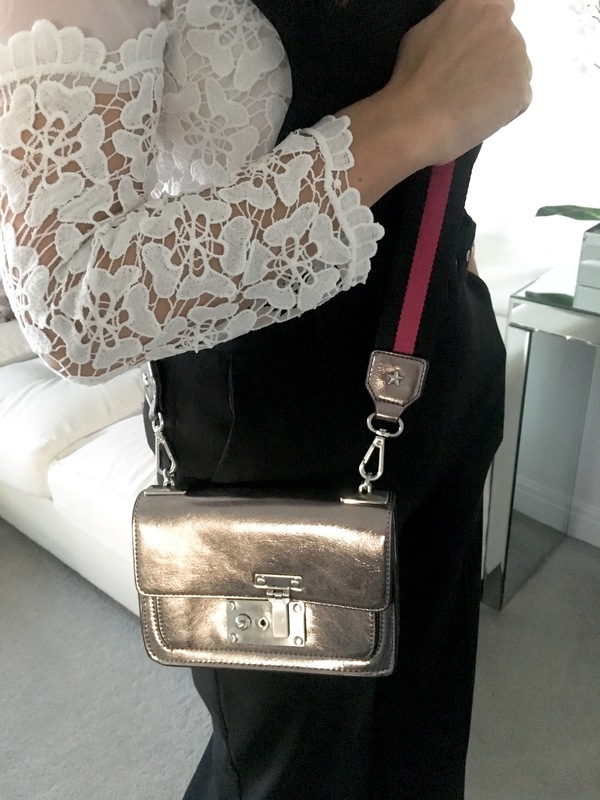 This weeks new purchase is from Zara’s new collection of handbags, the pewter colour makes it ideal to wear with most outfits and the military canvas strap is very reminiscent of Gucci styling. 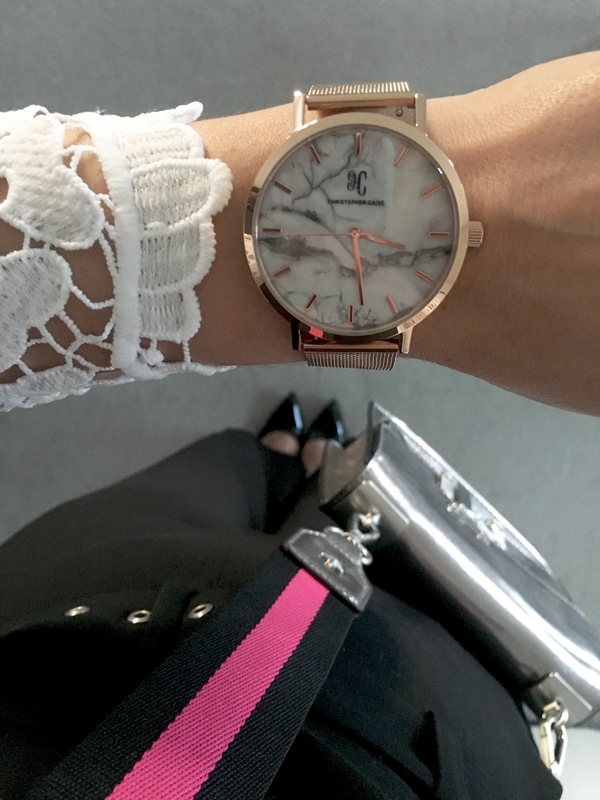 I’m in love with this rose gold and marble automatic timepiece by Christopher Caine its beautifully designed and adds a touch of luxury to any of my outfits.